Germany’s economic upturn, which has been ongoing for some time now, is dependent on having a reliable and low-cost supply of raw materials. This applies equally to metal resources and to energy sources such as coal. 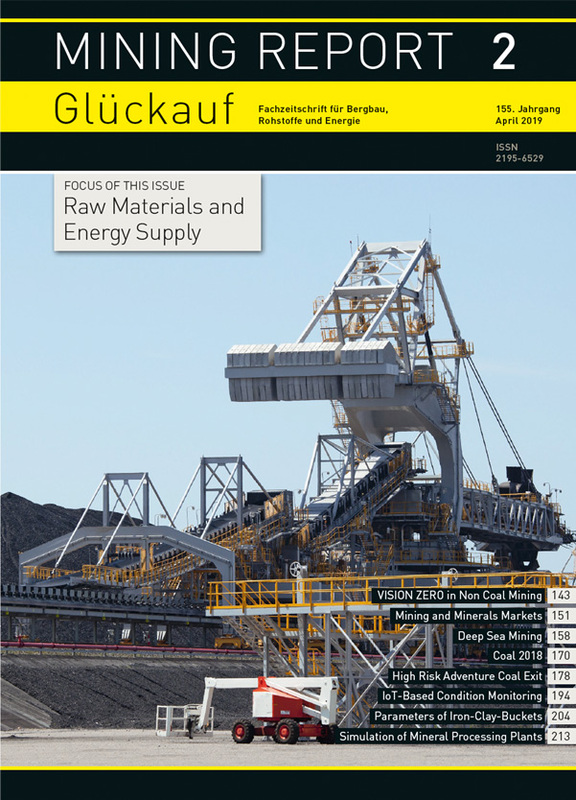 The latest edition of Mining Report Glückauf will therefore focus on this theme and examine it from a number of different angles. The German Federation of International Mining and Mineral Resources (FAB) is responsible for promoting Germany’s interests in the global commodities sector and is especially active in the international mining arena. 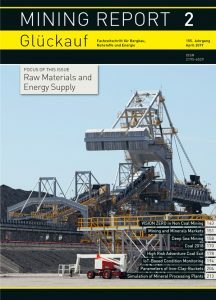 In this context the current issue includes a review of developments in the international coal and metal-resources markets. Increasing import dependency and difficult operating conditions in the conventional, land-based mining industry have forced economies with a high demand for raw materials to seek new sources of supply. The world’s ocean floor contains huge quantities of mineral resources. Fig. 4. 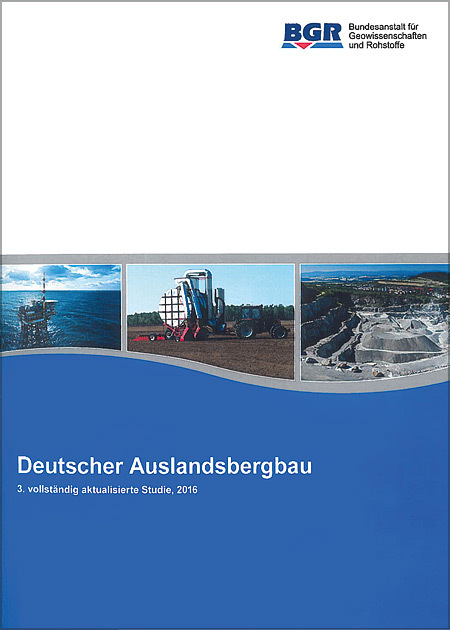 BGR publication „Deutscher Auslandsbergbau“ (“German Foreign Mining”). // Bild 4. 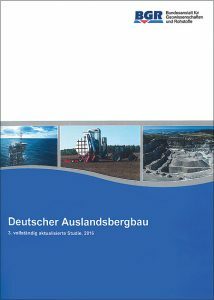 „Deutscher Auslandsbergbau“ (Veröffentlichung der BGR). The German Federation of International Mining and Mineral Resources (FAB) headquartered in Berlin/Germany is an association of German companies which are active within international mining. Since years FAB promotes the German positions in the global mineral sector and is active in continuous development of German international mining. The ongoing German economic boom requires further investments in order to ensure mid- to longterm minerals supply. In this regard the export of German know-how related to technical innovations and environmentally friendly mining is important. Since 2011 the worldwide exploration activities are on decline. The reason is the very good reserve basis which meets upon a gradually increasing demand situation for minerals. On the other hand the meanwhile increased global mineral consumption, mainly initiated by Asian consumers, may lead to supply bottlenecks in short term. For the manufacturing of economically important so called future technologies the global mineral demand will increase. Fig. 3. The Blue Mining SMnN concept. // Bild 3. Das Blue Mining Konzept zur Gewinnung von Manganknollen. In view of increasing import dependencies and decreasing ore grades in conventional mining, societies with large resource needs such as those of the EU are looking for new potential sources of mineral supplies. 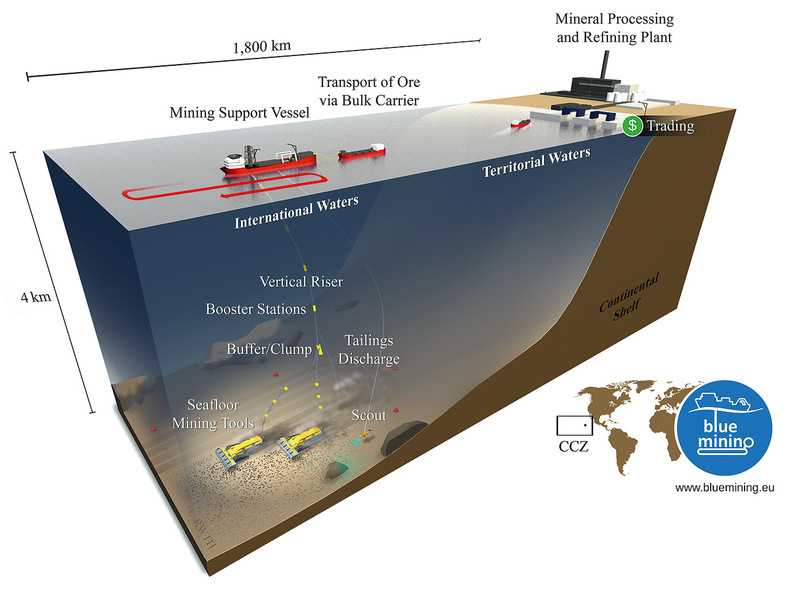 Seabed areas in international waters host considerable amounts of mineral resources that contain various elements, among them metals such as cobalt, copper, nickel and manganese that are used in today’s high- and green-tech applications, e. g., electric vehicles. The EU-funded (FP 7) Blue Mining project has investigated the resource potential of manganese nodules and seafloor massive sulphides. Blue Mining has studied and developed associated exploration methods and mining technologies. This paper gives insights into RWTH Aachen University’s work focussing on the economic relevance of deep-sea mining – both from the markets and the mining perspective. Any attempt to look ahead at the likely economic developments in 2019 must necessarily take into account a number of significant political events, some with potentially disruptive consequences. The first of these would be the trade disputes arising between the USA and other countries, most notably China, the hope being that these matters will soon be resolved. Another no less problematic issue for the European Union is Brexit, where the current negotiations seem at present to point to a less optimistic outcome. There are now fears of a recession because of these threats and because we may well be nearing the end of a long period of growth in many parts of the world. While any assessment of the German hard coal market also has to get an idea of the general economic developments, it is in fact more important to examine how the recommendations of the “Coal Commission” are being implemented at a political level. Looking back we can see that hard coal is already being subjected to disruptive development, to use that now familiar buzzword. The recommendations contained in the so called “Coal Commission” roadmap for phasing out coal-based electricity production will oblige the German energy industry and regional economies to embark on an adventure that is the result of climate-policy ambitions that no other sector has yet been asked to engage in. The Duden German language dictionary defines the word „adventure“ as an unusual and risky undertaking of uncertain outcome, an enterprise of an experimental nature that promises to deliver an exciting experience. And this author would argue that this exactly sums up the coal phase-out project. It is in fact rather like the Brexit debate in the UK. While the political decision-makers have a clear picture of what they want to get away from, they only have somewhat idealistic and hazy ideas about what can take its place. Now that the decision has been taken it is time for them to examine, or at least to find out, what kind of practical economic and social impact their decision will cause, and what serious financial implications it will have for the state sector. Fig. 3. Understanding big data – five V´s (Volume, Velocity, Variety, Veracity, and Value). // Bild 3. Big Data verstehen – fünf V´s (Volume, Velocity, Variety, Veracity, and Value). 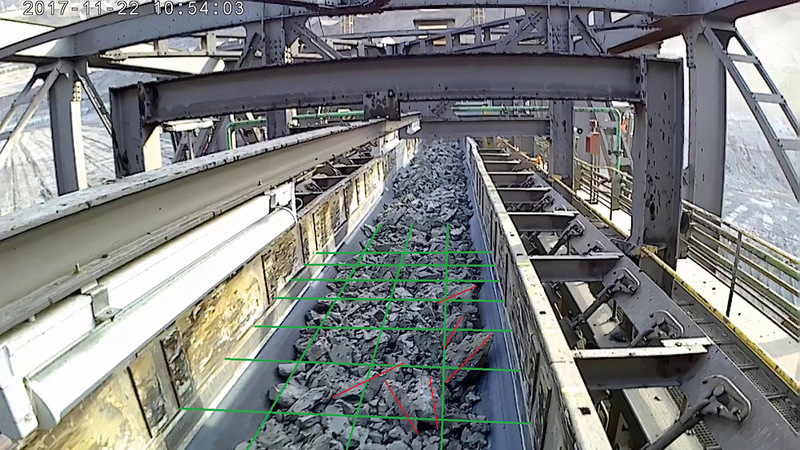 Condition monitoring and analysis of mining equipment requires more than suitable and reliable sensor technology, but also a holistic approach that makes use of interdisciplinary capabilities and intelligent software applications. Today, modern sensors consist of hardware and software components and ensure that machine data can be recorded and transmitted at any time. The Internet of Things (IoT) uses innovative software solutions to process the data collected on huge data platforms to make it available as valuable information. It is only with these technologies that the sensor data on the machine condition, which is available today but still little used, can be processed in such a way that measures for a considerable increase in availability and productivity can be implemented. Mineral processing plants are complex systems. Their products need to meet certain ridged criteria be it for use as a construction material or for further processing as an ore concentrate. The properties of a material entering the plant however may vary considerably. This is due to the location in the deposit it originates from as well as climate conditions. So one has to cope with varying particle size distributions (PSD’s), moisture content and material contaminations. During its way through the individual processing steps each piece of equipment will contribute to change the material towards the intended final product. Even though processing equipment is usually carefully selected and operated, the outcome is effected by its wear condition and operating setup. With all this influencing parameters it takes a lot of experience to run a mineral processing plant and keep the product within specification limits. 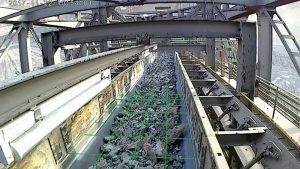 A decrease in output, caused by iron-clay or rather siderite, has been detected on the fifth and sixth floor of the opencast mine Hambach of RWE Power AG, Essen/Germany, since 2005. The material is known as hard to extract, so several special types of buckets were developed and used on the bucket wheel excavator 293. In this summarized diploma thesis the adjusted operating parameters up to now in the area of iron-clay should be verified with the current type of bucket, the iron-clay-bucket. Therefore, systematic trials were conducted locally and evaluated statistically. The increase in output with constant downtime mattered. The output increase especially depends on the protection of the bucket wheel excavator and the following conveyors.